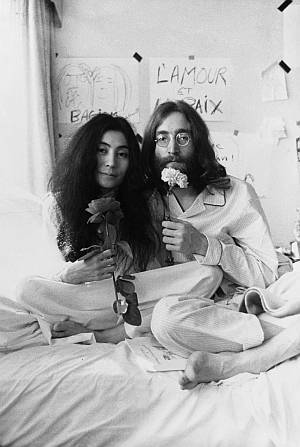 From the beginning of their relationship, John and Yoko moved steadily toward a public collaboration as artists and political activists. The crushing attention of the press on their personal lives was a catalyst for one of their most well-known events, the Bed-In: a honeymoon spent lying on a bed for a week, open to the press, in promotion of peace. This ingenious response functioned simultaneously as performance art, political protest, publicity stunt, and personal statement on the media. Apotheosis is a John-and-Yoko film collaboration which lifts off in a literal illustration of Ono’s career-long preoccupation with the sky. With cameraman and sound recordist inside, a hot-air balloon drifts past John and Yoko in closeup, lifts, and slowly ascends. Spending long moments inside the clouds, it finally breaks through to the magnificent sky and sun above.